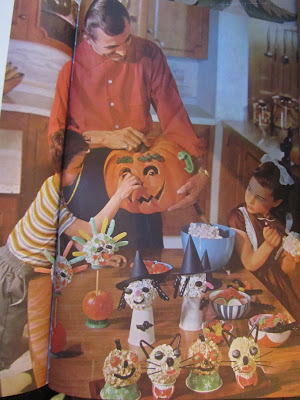 Do you have any favorite Hallowe'en traditions? Don't you just love Sissy's big white hair ribbon? Dad looks so smart with his slicked-back hair! Northwest. I'd bundle my kids up in parkas and we'd all wear gloves. Some years we dodged the raindrops, too. So, yes, I'm glad we're done with the trick-or-treating. This also means we don't have to squeeze all of our little traditions into those couple of hours between getting the kids home from school and going out trick-or-treating (around 7:30PM here). Making and eating dinner, making our popcorn balls, getting the treats all set out and ready (okay, not a huge job) and helping everyone into their costumes -- all these things take time. Now, we can enjoy each moment. I think one of my favorite traditions is making the popcorn balls. I use a recipe from a holiday celebration cookbook that my mom had. We all stand around the stove and singe the tiny hairs off our fingers while forming the sticky balls. Then we eat a bunch of them, until our tummies can't hold any more. I think popcorn balls taste a lot like snickers bars without the chocolate. Imagine how yummy they'd be coated in chocolate. So here's the recipe we use. Keep the popcorn warm, in a large pan (I use my turkey roaster), in a 200 degree F oven. In the saucepan, stir together sugar, water, salt, corn syrup, and vinegar. Bring to a boil and cook to 250 degrees F (hard-ball). Remove from heat. Add vanilla. Bringing the syrup to 250 degrees F takes about 10-15 minutes. Removed popcorn from the oven. Pour a thin stream of syrup all over the popped corn. Working quickly, use a large spoon or spatula to combine, as best as possible. Butter hands and scoop coated popcorn. Press firmly into balls. Optional -- decorate with candies as desired. Does your family have any Hallowe'en traditions? Any special, kid-friendly dinners? Ours was always grilled cheese sandwiches and tomato soup. When my I was growing up, 12 years old was my mother's cutoff age for Trick or Treating. We got around that by Trick or Treating for Unicef when we got older which we usually did as part of a church group. We didn't get as much candy as when we were younger, but we did get some along with the coins that were put into our boxes. Our cut-off was the end of middle school. Now I see kids that are clearly approaching the end of their teen years! Off topic -- everything okay in your area? Hope so. Since my only child has grown up and left home (last year), this will be the first year I've worked Hallowe'en night! My spouse will be home to hand out candy. I work in a public library - the neighbourhood kids won't be in tonight, so we are going to have treats for the adult library customers! I'll bet the mood in your library will be festive tonight! Have fun at work. I love popcorn balls!! After taking my boys for years trick or treating I was happy to end that tradition. With grand children, they now come to my house last where I have a small treat for them and we sit down to a slice of pumpkin pie. My new tradition is delicious and I stay warm for once. I love popcorn balls, too. And I like them even more on day 2 when they get a little soggy. I love your Hallowe'en tradition, especially with the part of ending the evening with a slice of pumpkin pie. I'm glad that Sandy didn't do too much damage in your area, and that you're safe and sound!